This bicycle is visually wonderful for its well balanced form. The mechanism is notable too. The most unique point is the combination of "shaft drive system" and "folding structure." When folding it, there is no need to fuss about the dirty oil at all. It can be put away in the porch, in the car trunk, or elsewhere without any care. This is indeed an ideal product realized thanks to the complete matching of mechanism and functional purpose. 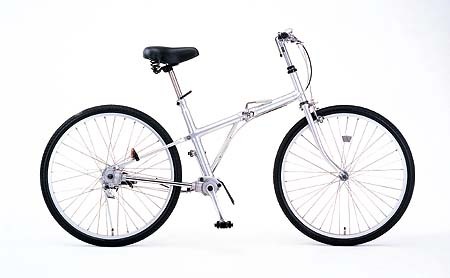 In addition, the price is so reasonable since bicycle applying the shaft drive system has been regarded to be too expensive before. However, it could not but end its life likewise many other general products of good design. That is, perhaps because bicycles are quite easy to develop, it was never refined but had to conclude itself at a point. It is a regret that this product is no more manufactured, for there still remains issues to be solved so that it may have been redesigned and sophisticated more.